"French Africa" redirects here. For the French-speaking portion of Africa, see African French. 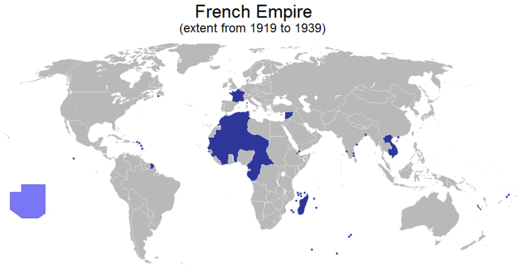 The French colonial empire constituted the overseas colonies, protectorates and mandate territories that came under French rule from the 16th century onward. A distinction is generally made[by whom?] between the "first colonial empire," that existed until 1814, by which time most of it had been lost, and the "second colonial empire", which began with the conquest of Algiers in 1830. The second colonial empire came to an end after the loss in later wars of Indochina (1954) and Algeria (1962), and relatively peaceful decolonizations elsewhere after 1960. 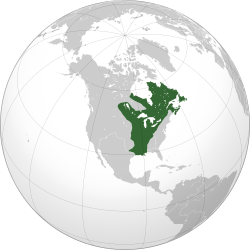 Competing with Spain, Portugal, the Dutch United Provinces and later England, France began to establish colonies in North America, the Caribbean and India in the 17th century. A series of wars with Britain and others resulted in France losing nearly all of its conquests by 1814. France rebuilt a new empire mostly after 1850, concentrating chiefly in Africa as well as Indochina and the South Pacific. Republicans, at first hostile to empire, only became supportive when Germany started to build their own colonial empire. As it developed, the new empire took on roles of trade with France, especially supplying raw materials and purchasing manufactured items as well as lending prestige to the motherland and spreading French civilization and language and the Catholic religion. It also provided manpower in the World Wars. A major goal was the Mission civilisatrice the mission to spread French culture, language and religion, and this proved successful. In 1884, the leading proponent of colonialism, Jules Ferry, declared; "The higher races have a right over the lower races, they have a duty to civilize the inferior races." Full citizenship rights – assimilation – were offered, although in reality "assimilation was always receding [and] the colonial populations treated like subjects not citizens." France sent small numbers of settlers to its empire, contrary to Great Britain and previously Spain and Portugal, with the only notable exception of Algeria, where the French settlers nonetheless always remained a small minority. At its apex, it was one of the largest empires in history. Including metropolitan France, the total amount of land under French sovereignty reached 11,500,000 km2 (4,400,000 sq mi) in 1920, with a population of 110 million people in 1939. In World War II, Charles de Gaulle and the Free French used the overseas colonies as bases from which they fought to liberate France. Historian Tony Chafer argues: "In an effort to restore its world-power status after the humiliation of defeat and occupation, France was eager to maintain its overseas empire at the end of the Second World War." However, after 1945 anti-colonial movements began to challenge European authority. The French constitution of 27 October 1946 (Fourth Republic), established the French Union which endured until 1958. Newer remnants of the colonial empire were integrated into France as overseas departments and territories within the French Republic. These now total altogether 119,394 km² (46,098 sq. miles), which amounts to only 1% of the pre-1939 French colonial empire's area, with 2.7 million people living in them in 2013. By the 1970s, says Robert Aldrich, the last "vestiges of empire held little interest for the French." He argues, "Except for the traumatic decolonization of Algeria, however, what is remarkable is how few long-lasting effects on France the giving up of empire entailed." The French colonial empire in the Americas comprised New France (including Canada and Louisiana), French West Indies (including Saint-Domingue, Guadeloupe, Martinique, Dominica, St. Lucia, Grenada, Tobago and other islands) and French Guiana. During the 16th century, the French colonization of the Americas began. Excursions of Giovanni da Verrazzano and Jacques Cartier in the early 16th century, as well as the frequent voyages of French boats and fishermen to the Grand Banks off Newfoundland throughout that century, were the precursors to the story of France's colonial expansion. But Spain's defense of its American monopoly, and the further distractions caused in France itself in the later 16th century by the French Wars of Religion, prevented any constant efforts by France to settle colonies. Early French attempts to found colonies in Brazil, in 1555 at Rio de Janeiro ("France Antarctique") and in Florida (including Fort Caroline in 1562), and in 1612 at São Luís ("France Équinoxiale"), were not successful, due to a lack of official interest and to Portuguese and Spanish vigilance. 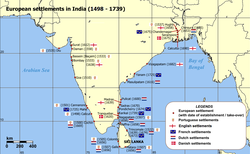 Colonies were established in India's Chandernagore (1673) and Pondichéry in the south east (1674), and later at Yanam (1723), Mahe (1725), and Karikal (1739) (see French India). 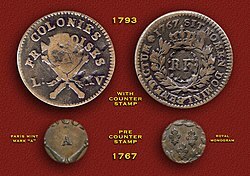 Colonies were also founded in the Indian Ocean, on the Île de Bourbon (Réunion, 1664), Isle de France (Mauritius, 1718), and the Seychelles (1756). In the middle of the 18th century, a series of colonial conflicts began between France and Britain, which ultimately resulted in the destruction of most of the first French colonial empire and the near-complete expulsion of France from the Americas. These wars were the War of the Austrian Succession (1740–1748), the Seven Years' War (1756–1763), the American Revolution (1765–1783), the French Revolutionary Wars (1793–1802) and the Napoleonic Wars (1803–1815). It may even be seen further back in time to the first of the French and Indian Wars. This cyclic conflict is sometimes known as the Second Hundred Years' War. 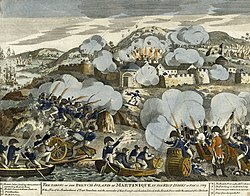 Although the War of the Austrian Succession was indecisive – despite French successes in India under the French Governor-General Joseph François Dupleix and Europe under Marshal Saxe – the Seven Years' War, after early French successes in Menorca and North America, saw a French defeat, with the numerically superior British (over one million to about 50 thousand French settlers) conquering not only New France (excluding the small islands of Saint Pierre and Miquelon), but also most of France's West Indian (Caribbean) colonies, and all of the French Indian outposts. 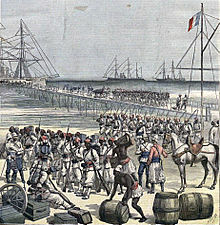 The slaves, led eventually by Toussaint L'Ouverture and then, following his capture by the French in 1801, by Jean-Jacques Dessalines, held their own against French and British opponents, and ultimately achieved independence as Empire of Haiti in 1804 (Haiti became the first black republic in the world, followed by Liberia in 1847). The black and mulatto population of the island (including the Spanish east) had declined from 700,000 in 1789 to 351,819 in 1804. About 80,000 Haitians died in the 1802–03 campaign alone. Of the 55,131 French soldiers dispatched to Haiti in 1802–03, 45,000, including 18 generals, had died, along with 10,000 sailors, the great majority from disease. Captain [first name unknown] Sorrell of the British navy observed, "France lost there one of the finest armies she ever sent forth, composed of picked veterans, the conquerors of Italy and of German legions. She is now entirely deprived of her influence and her power in the West Indies." In the meanwhile, the newly resumed war with Britain by the French, resulted in the British capture of practically all remaining French colonies. These were restored at the Treaty of Amiens in 1802, but when war resumed in 1803, the British soon recaptured them. France's repurchase of Louisiana in 1800 came to nothing, as the success of the Haitian Revolution convinced Napoleon that holding Louisiana would not be worth the cost, leading to its sale to the United States in 1803. The French attempt to establish a colony in Egypt in 1798–1801 was not successful. Battle casualties for the campaign were at least 15,000 killed or wounded and 8,500 prisoners for France; 50,000 killed or wounded and 15,000 prisoners for Turkey, Egypt, other Ottoman lands, and Britain. 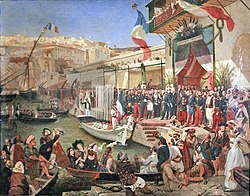 The beginnings of the second French colonial empire were laid in 1830 with the French invasion of Algeria, which was conquered over the next 17 years. One authority counts 825,000 Algerian victims of the French conquest. Napoleon III doubled the area of the French overseas Empire; he established French rule in New Caledonia, and Cochinchina, established a protectorate in Cambodia (1863); and colonized parts of Africa. He joined Britain sending an army to China during Second Opium War and the Taiping Rebellion (1860), but French ventures to establish influence in Japan (1867) and Korea (1866) were less successful. His attempt to impose a European monarch, Maximilian I of Mexico on the Mexicans ended in a spectacular failure in 1867. To restore the Mexican Republic, 31,962 Mexicans died violently, including over 11,000 executed by firing squads, 8,304 were seriously wounded and 33,281 endured captivity in prisoner of war camps. Those Mexicans who fought for the monarchy sacrificed 5,671 of their number killed in combat, 2,159 badly wounded, and 4,379 taken prisoner. The French suffered 1,729 battle deaths, including 549 who died of wounds, 2,559 wounded, and 4,925 dead from disease. 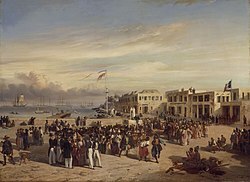 On 24 September 1853, Admiral Febvrier Despointes took formal possession of New Caledonia and Port-de-France (Nouméa) was founded 25 June 1854. A few dozen free settlers settled on the west coast in the following years, but New Caledonia became a penal colony and, from the 1860s until the end of the transportations in 1897, about 22,000 criminals and political prisoners were sent to New Caledonia. In Japan the Meiji Emperor, and his enemies, the Tokugawa shogunate, both sought French military training and technology in their battle for power, known as the Boshin War. In 1867, a military mission to Japan played a key role in modernizing the troops of the shōgun Tokugawa Yoshinobu, and even participated on his side against Imperial troops during the Boshin war. The European representative of the Shogunate, Shibata Takenaka, approached both Britain and France, asking assistance to build a modern shipyard and to train the Shogunate army in modern western warfare. The shipyard, which became the naval base of Yokosuka, was designed by the French engineer Leonce Verny. The British, who supported the imperial faction, declined to provide trainers, but Napoleon III agreed, and in 1867 dispatched a delegation of nineteen French military experts in the fields of infantry, cavalry and artillery to Japan. They trained an elite corps, called the Denshutai, to fight on the side of the shōgun. Queen Pōmare IV in 1860. 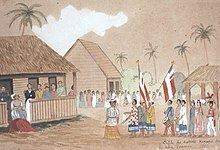 Tahiti was made a French protectorate in 1842, and annexed as a colony of France in 1880. Between 500,000 and 1,000,000, from approximately 3 million Algerians, were killed within the first three decades of the conquest as a result of war, massacres, disease and famine. French losses from 1830–51 were 3,336 killed in action and 92,329 dead in the hospital. Compared to previous administrations, Napoleon III was far more sympathetic to the native Algerians. He halted European migration inland, restricting them to the coastal zone. He also freed the Algerian rebel leader Abd al Qadir (who had been promised freedom on surrender but was imprisoned by the previous administration) and gave him a stipend of 150,000 francs. He allowed Muslims to serve in the military and civil service on theoretically equal terms and allowed them to migrate to France. In addition, he gave the option of citizenship; however, for Muslims to take this option they had to accept all of the French civil code, including parts governing inheritance and marriage which conflicted with Muslim laws, and they had to reject the competence of religious Sharia courts. This was interpreted by some Muslims as requiring them to give up parts of their religion to obtain citizenship and was resented. Napoleon III tried unsuccessfully to place Maximilian I, brother of the Austrian Emperor, on the throne of Mexico. Portrait by Franz Xaver Winterhalter in Chapultepec Castle, Mexico. Juarez opened negotiations with the international force, but it soon became evident that the French expedition had a more ambitious objective than debt repayment. 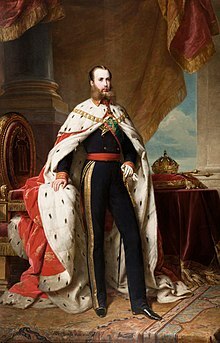 Napoleon III and the Empress had been intensively lobbied by Mexican émigrés in Europe, who proposed that France establish a new conservative and Catholic government in Mexico, under a European monarch. Napoleon III was told that the new monarch would be welcomed by the entire Mexican population. He consented to launch the operation if the new monarch would be approved by a national plebiscite, as he had been. The monarch selected for this task was the Archduke Maximilian, the brother of the Austrian Emperor Franz-Joseph II, and husband of Carlota of Mexico, daughter of the King of Belgium. Maximilian was a reluctant Emperor, not arriving in Mexico until June 1864. One of his first acts was to sign an agreement that Mexico would repay France the entire cost of the war. 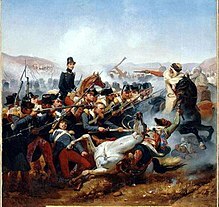 The combined Mexican monarchist and French forces won victories up until 1865, but then the tide began to turn against them, in part because the American Civil War had ended. The U.S. government demanded that France withdraw its soldiers from Mexico. Facing a guerilla war and a financial catastrophe, the Emperor Maximilian became more and more depressed, leaving the capital for long periods and allowing the Empress Carlota to reign. Not willing to have a war with the United States, Napoleon III decided at the beginning of 1866 to withdraw French troops from Mexico. In 1863 Maximilian had sent Carlota to Europe to appeal for funds and support. She appealed to Napoleon III, but he refused to provide more troops or money. During her tour of European courts, she lost and never regained her sanity. Maximilian refused pleas that he depart, and fought against the growing partisan army of Juarez. He was captured, judged, and shot on 19 June 1867. The execution of Maximilian I on 19 June 1867, as painted by Édouard Manet. The intervention in Mexico was a disaster for French foreign policy. Despite the signing of the 1860 Cobden–Chevalier Treaty, a historic free trade agreement between Britain and France, and the joint operations conducted by France and Britain in the Crimea, China and Mexico, diplomatic relations between Britain and France never became close. Lord Palmerston, the British foreign minister from 1846 to 1851 and prime minister from 1855 to 1865, sought to maintain the balance of power in Europe; this rarely involved an alignment with France. In 1859 there were even briefly fears that France might try to invade Britain. Palmerston was suspicious of France's interventions in Lebanon, Southeast Asia and Mexico. Palmerston was also concerned that France might intervene in the American Civil War (1861–65) on the side of the South. The British also felt threatened by the construction of the Suez Canal (1859–1869) by Ferdinand de Lesseps in Egypt. They tried to oppose its completion by diplomatic pressures and by promoting revolts among workers. Most Frenchmen ignored foreign affairs and colonial issues. In 1914 the chief pressure group was the Parti colonial, a coalition of 50 organizations with a combined total of only 5000 members. France also extended its influence in North Africa after 1870, establishing a protectorate in Tunisia in 1881 with the Bardo Treaty. Gradually, French control crystallised over much of North, West, and Central Africa by around the start of the 20th century (including the modern states of Mauritania, Senegal, Guinea, Mali, Ivory Coast, Benin, Niger, Chad, Central African Republic, Republic of the Congo, Gabon, Cameroon, the east African coastal enclave of Djibouti (French Somaliland), and the island of Madagascar). While the first stages of a takeover often involved the destruction of historic buildings in order to use the site for French headquarters, archaeologists and art historians soon engaged in systematic effort to identify, map and preserve historic sites, especially temples such as Angkor Wat, Champa ruins and the temples of Luang Prabang. Many French museums have collections of colonial materials. Since the 1980s the French government has opened new museums of colonial artifacts including the Musée du Quai Branly and the Cité Nationale de l’Histoire de l’Immigration, in Paris; and the Maison des Civilisations et de l’Unité Réunionnaise in Réunion. The Berber independence leader Abd el-Krim (1882–1963) organized armed resistance against the Spanish and French for control of Morocco. The Spanish had faced unrest off and on from the 1890s, but in 1921 Spanish forces were massacred at the Battle of Annual El-Krim founded an independent Rif Republic that operated until 1926 but had no international recognition. Paris and Madrid agreed to collaborate to destroy it. They sent in 200,000 soldiers, forcing el-Krim to surrender in 1926; he was exiled in the Pacific until 1947. Morocco became quiet, and in 1936 became the base from which Francisco Franco launched his revolt against Madrid. The gradual loss of all Vichy territory to Free France and the Allies by 1943. Legend. The manifesto angered nationalists across the Empire, and set the stage for long-term wars in Indochina and Algeria that France would lose in humiliating fashion. The French colonial empire began to fall during the Second World War, when various parts were occupied by foreign powers (Japan in Indochina, Britain in Syria, Lebanon, and Madagascar, the United States and Britain in Morocco and Algeria, and Germany and Italy in Tunisia). However, control was gradually reestablished by Charles de Gaulle. The French Union, included in the Constitution of 1946, nominally replaced the former colonial empire, but officials in Paris remained in full control. The colonies were given local assemblies with only limited local power and budgets. There emerged a group of elites, known as evolués, who were natives of the overseas territories but lived in metropolitan France. France was immediately confronted with the beginnings of the decolonisation movement. In Algeria demonstrations in May 1945 were repressed with an estimated 6,000 Algerians killed. Unrest in Haiphong, Indochina, in November 1945 was met by another warship bombarding the city. Paul Ramadier's (SFIO) cabinet repressed the Malagasy Uprising in Madagascar in 1947. French officials estimated the number of Malagasy killed from a low of 11,000 to a French Army estimate of 89,000. In Asia, Ho Chi Minh's Vietminh declared Vietnam's independence, starting the First Indochina War. The French Union's struggle against the independence movement, which was backed by the Soviet Union and China. The war dragged on until 1954 after the Battle of Dien Bien Phu in northern Vietnam and became the last major battle between the French and the Vietnamese in the First Indochina War. Following the Vietnamese victory Dien Bien Phu and the signing of the 1954 Geneva Accords. France agreed to withdraw its forces from all its colonies in French Indochina, while stipulating that Vietnam would be temporarily divided at the 17th parallel, with control of the north given to the Viet Minh as the Democratic Republic of Vietnam under Ho Chi Minh, and the south becoming the State of Vietnam. The refusal of Ngô Đình Diệm (the US-supported president of the first Republic of Vietnam [RVN]) to allow elections in 1956, as had been stipulated by the Geneva Conference, eventually led to the Vietnam War. In France's African colonies, Cameroun, the Union of the Peoples of Cameroon's insurrection, started in 1955 and headed by Ruben Um Nyobé, was violently repressed over a two-year period, with perhaps as many as 100 people killed. French involvement in Algeria stretched back a century. Ferhat Abbas and Messali Hadj's movements had marked the period between the two wars, but both sides radicalised after the Second World War. In 1945, the Sétif massacre was carried out by the French army. The Algerian War started in 1954. Atrocities characterized both sides, and the number killed became highly controversial estimates that were made for propaganda purposes. Algeria was a three-way conflict due to the large number of "pieds-noirs" (Europeans who had settled there in the 125 years of French rule). The political crisis in France caused the collapse of the Fourth Republic, as Charles de Gaulle returned to power in 1958 and finally pulled the French soldiers and settlers out of Algeria by 1962. Robert Aldrich argues that with Algerian independence in 1962, it appeared that the Empire practically had come to an end, as the remaining colonies were quite small and lacked active nationalist movements. However, there was trouble in French Somaliland (Djibouti), which became independent in 1977. There also were complications and delays in the New Hebrides Vanuatu, which was the last to gain independence in 1980. New Caledonia remains a special case under French suzerainty. The Indian Ocean island of Mayotte voted in referendum in 1974 to retain its link with France and forgo independence. ^ Rein Taagepera (September 1997). "Expansion and Contraction Patterns of Large Polities: Context for Russia". International Studies Quarterly. 41 (3): 501. doi:10.1111/0020-8833.00053. JSTOR 2600793. ^ Herbert Ingram Priestley (2018). France Overseas: A Study of Modern Imperialism. p. 192. ISBN 9781351002417. ^ Mathew Burrows, "‘Mission civilisatrice’: French cultural policy in the Middle East, 1860–1914." Historical Journal 29.1 (1986): 109–135. ^ Singer, Barnett; Langdon, John (2008). Cultured Force: Makers and Defenders of the French Colonial Empire. University of Wisconsin Press. p. 24. ISBN 9780299199043. ^ Steven R. Pendery, "A Survey Of French Fortifications In The New World, 1530–1650." in First Forts: Essays on the Archaeology of Proto-colonial Fortifications ed by Eric Klingelhofer (Brill 2010) pp. 41–64. 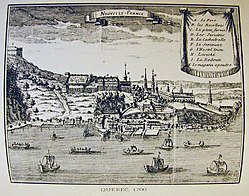 ^ Marcel Trudel, The Beginnings of New France, 1524–1663 (McClelland & Stewart, 1973). ^ Edward Robert Adair, "France and the Beginnings of New France." Canadian Historical Review 25.3 (1944): 246–278. ^ Helen Dewar, "Canada or Guadeloupe? : French and British Perceptions of Empire, 1760–1763." Canadian Historical Review 91.4 (2010): 637–660. ^ a b c Andrew, C. M.
^ Andrew, C. M., and A. S. . KANYA-FORSTNER. "FRANCE, AFRICA, AND THE FIRST WORLD WAR." The Journal of African History 19.1 (1978): 11–23. Print. ^ Mimi Sheller, "The 'Haytian Fear': Racial Projects and Competing Reactions to the First Black Republic." Research in Politics and Society 6 (1999): 285–304. ^ Warfare and Armed Conflicts: A Statistical Encyclopedia of Casualty and Other Figures, 1492–2015, 4th ed. McFarland. 9 May 2017. p. 142. ^ Scheina. Latin America's Wars. ^ Warfare and Armed Conflicts: A Statistical Encyclopedia of Casualty and Other Figures, 1492–2015, 4th ed. McFarland. 9 May 2017. p. 106. ^ David Patrick Geggus (2002). Haitian Revolutionary Studies. Indiana University Press. p. 28. ISBN 9780253109262. ^ Warfare and Armed Conflicts: A Statistical Encyclopedia of Casualty and Other Figures, 1492–2015, 4th ed. McFarland. 9 May 2017. p. 199. ^ Warfare and Armed Conflicts: A Statistical Encyclopedia of Casualty and Other Figures, 1492–2015, 4th ed. McFarland. 9 May 2017. p. 305. ^ Robert Aldrich; John Connell (2006). France's Overseas Frontier: Départements et territoires d'outre-mer. Cambridge University Press. p. 46. ISBN 978-0-521-03036-6. ^ G. Wesley Johnson, Double Impact: France and Africa in the age of imperialism (Greenwood 1985). ^ H. M. Cole, "Origins of the French Protectorate Over Catholic Missions in China." American Journal of International Law (1940): 473–491. ^ Daniel C. Kane, "Bellonet and Roze: Overzealous Servants of Empire and the 1866 French Attack on Korea," Korean Studies (1999) Vol. 23, pp 1–23. ^ Bennoune, Mahfoud (2002-08-22). The Making of Contemporary Algeria, 1830–1987. ISBN 9780521524322. ^ "French Conquest of Algeria (1829–47)". ^ Abun-Nasr, Jamil M. (1987). A History of the Maghrib in the Islamic period. Cambridge University Press. p. 264. ISBN 978-0-521-33767-0. Retrieved 10 November 2010. ^ Jamil M. Abun-Nasr (1987). A History of the Maghrib in the Islamic Period. Cambridge U.P. p. 264. ISBN 9780521337670. ^ Charles M. Hubbard (2000). The Burden of Confederate Diplomacy. Univ. of Tennessee Press. p. 163. ISBN 9781572330924. ^ Jasper Ridley, Maximilian and Juárez (1992). ^ Desmond Gregory (1999). No Ordinary General: Lt. General Sir Henry Bunbury (1778–1860) : the Best Soldier Historian. Fairleigh Dickinson U.P. p. 103. ^ K. Bell, "British Policy towards the Construction of the Suez Canal, 1859–65," Transactions of the Royal Historical Society (1965) Vol. 15, pp 121–143. ^ Paul French (2011). The Old Shanghai A-Z. Hong Kong University Press. p. 215. ISBN 9789888028894. ^ Claire Hirshfield (1979). The diplomacy of partition: Britain, France, and the creation of Nigeria, 1890–1898. Springer. p. 37ff. ISBN 978-90-247-2099-6. Retrieved 10 October 2010. ^ T. G. Otte, "From 'War-in-Sight' to Nearly War: Anglo–French Relations in the Age of High Imperialism, 1875–1898," Diplomacy & Statecraft (2006) 17#4 pp 693–714. ^ Betts, Raymond F. (2005). Assimilation and Association in French Colonial Theory, 1890–1914. University of Nebraska Press. p. 10. ISBN 9780803262478. ^ Olivier Le Cour Grandmaison, De l'Indigénat. Anatomie d'un monstre juridique: Le Droit colonial en Algérie et dans l'Empire français, Éditions La Découverte, Paris, 2010, p. 59. ^ Le Cour Grandmaison, p. 60, note 9. ^ "Slave Emancipation and the Expansion of Islam, 1905–1914 Archived 2 May 2013 at the Wayback Machine". p.11. ^ Alexander Mikaberidze (2011). Conflict and Conquest in the Islamic World: A Historical Encyclopedia. ABC-CLIO. p. 15. ISBN 9781598843361. ^ Joseph R. De Benoist, "The Brazzaville Conference, or Involuntary Decolonization." Africana Journal 15 (1990) pp: 39–58. ^ Simpson, Alfred William Brian (2004). Human Rights and the End of Empire: Britain and the Genesis of the European Convention. Oxford University Press. pp. 285–86. ISBN 978-0199267897. ^ Horne, Alistair (1977). A Savage War of Peace: Algeria 1954–1962. New York: The Viking Press. p. 27. ^ Martin S. Alexander; et al. (2002). Algerian War and the French Army, 1954–62: Experiences, Images, Testimonies. Palgrave Macmillan UK. p. 6. ISBN 9780230500952. ^ Dorothy Shipley White, Black Africa and de Gaulle: From the French Empire to Independence (1979). ^ "Mayotte votes to become France's 101st département". The Daily Telegraph. 29 March 2009. ^ Herbert Ingram Priestley, France overseas: a study of modern imperialism (1938) pp 440–41. ^ INSEE. "TABLEAU 1 – ÉVOLUTION GÉNÉRALE DE LA SITUATION DÉMOGRAPHIQUE" (in French). Retrieved 3 November 2010. ^ Statistique générale de la France. "Code Officiel Géographique – La IIIe République (1919–1940)" (in French). Retrieved 3 November 2010. ^ "British North America: 1763–1841". Archived from the original on 1 November 2009. ^ Bill Marshall (2005). France and the Americas: culture, politics, and history : a multidisciplinary encyclopedia. N – Z, index. ABC-CLIO. Pp. 372–373. ISBN 1851094113. ^ "For Pieds-Noirs, the Anger Endures". nytimes.com. 6 April 1988. Retrieved 2 April 2016. Burrows, Mathew (1986). "'Mission civilisatrice': French Cultural Policy in the Middle East, 1860–1914". The Historical Journal. 29 (1): 109–135. doi:10.1017/S0018246X00018641. .
Chafer, Tony (2002). The End of Empire in French West Africa: France's Successful Decolonization?. Berg. ISBN 9781859735572. Newbury, C. W.; Kanya-Forstner, A. S. (1969). "French Policy and the Origins of the Scramble for West Africa". The Journal of African History. 10 (2): 253–276. JSTOR 179514. .
Confer, Vincent (1964). "French Colonial Ideas before 1789". French Historical Studies. 3 (3): 338–359. doi:10.2307/285947. JSTOR 285947. .
Martin, Guy (1985). "The Historical, Economic, and Political Bases of France's African Policy". The Journal of Modern African Studies. 23 (2): 189–208. doi:10.1017/S0022278X00000148. .
Emerson, Rupert (1969). "Colonialism". Journal of Contemporary History. 4 (1): 3–16. doi:10.1177/002200946900400101. .